Railway Recruitment Board(RRB) conducted RRB Technician & ALP 2018 First Stage Online Examination successfully in the month of August 2018. Now, second stage exam started from today(20 jan 2019). 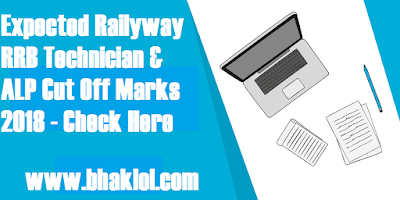 We are sharing RRB Technician & ALP Stage 2 Expected Cut Off Marks 2018-2019. Prediction has been made out of 100 Marks(Only Part-A). Part-B is just qualifying in nature. First Stage of RRB ALP 2018 Computer Based Test(CBT) has 4 subject sections comprising 75 questions, each question carries one mark. Test Duration of first stage was 60 minutes. One-Third negative marking was in the first stage CBT for each wrong attempt. RRB will conduct total four stages for RRB ALP selection viz. First Stage CBT, Second Stage CBT , Aptitude Test(Computer Based) and Document Verification. First Stage CBT of RRB ALP and Technicans 2018 is qualifying in nature, score of this examination will not be considered for final merit list. Its the gateway to appear in Second stage CBT. a. 15 times the vacancy published by RRB will be shortlisted for second stage CBT. b. As ALP answer key has been releaesd and if you are in the above line then you will be shortlisted for second stage CBT. We are sharing previous years RRB ALP Cut Off which will give you the more idea about the RRB ALP and Technician 2018 cut off prediction.